The best way to worship Mother Goddess Shakti is to meditate on Her. Beginers may chose breathing passing point in between center of two ears, where nearby Ajna Chakra/ Pineal Chakra exist. assume that on that point Mother Goddess exist. If you have faith in Mother Goddess Shakti, then She definitely exist there. Meditate on that point, I mean meditate on Mother Goddess Shakti on that point. It's a bit difficult for a full-on Shiv Bhakta to worship the Divine Mother after noting everything is Shiva, with Shakti only a manifestation of the Saguna aspect of Brahman and the challenge for me this Navaratri has been to try and find my own personal 'workable model' of the Divine Goddess. So, I started out with Ardhanarishwara and I could accept that. I could accept the Goddess as being Shive (or the feminine form of Shiva) and yet I wanted to go deeper, so I went into the whole Shri Yantra and made it my avatar. The triangles pointing downward represent Shiva, as the energies flowing down from the Crown Chakra and the triangles pointing upwards are the energies from the Goddess, flowing upwards from Muladhara and thus, I worship the Goddess in the forms of Lakini, Dakini, Makini and Kundalini herself! The latent power existing within us all and everything is just a representation of Her! 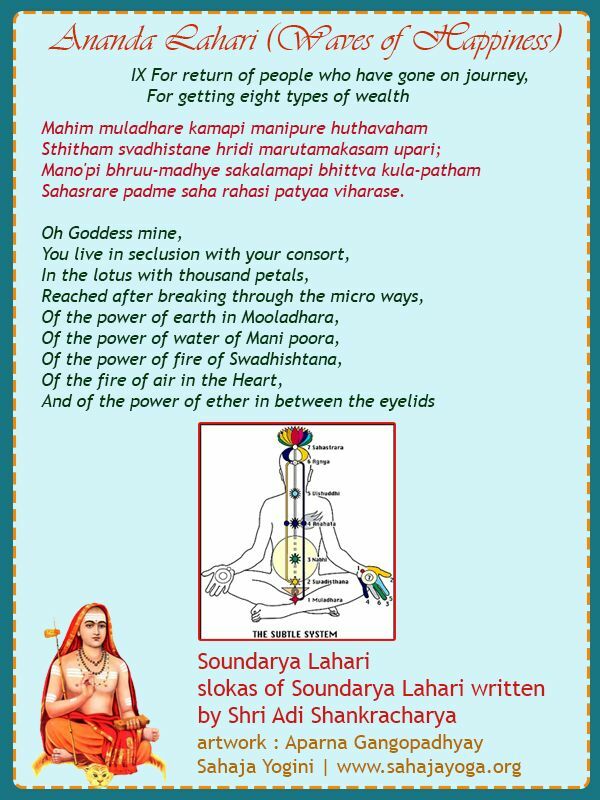 So, with that I went back to joyfully reading Adi Shankara's Soundarya Lahari again. I second your post. I have had some problems too with this Goddess worship as my mind tends to stick to Shiva...isness. I have always loved the iconography of Shiva. And also I have repeated a Shiva mantra for decades. Still that path I'm on is a path which worship shakti and Shiva. I struggle with the concept (and truth) of the fact that Shiva and Shakti are ONE. Worship of Mother IS worship of Shiva. And as you also say that the road to Shiva is through the Shakti. This is said also on paths which are more exclusive Shiva centered paths like Lakshan joo's teachings et.c.. I have alternated with Devi bhakti and Shiva bhakti feeling a bit torn. But slowly the issue have been more blended. I have also practiced the "trick" of worshipping Ardanishwara - the half shiva - half shakti picture. During navratri I have practiced some devi mantran, but still sticked to an increased effort of my Shiva mantra. Swami Shivananda in his book about hindu festivals said that increased Japa of your tutelary deity is what his devotees do during navratri. 3.All are exhorted to do the maximum number of Japa of the Navarna Mantra, Aim hreem kleem chaamundaayai vichche, or the Mantra of their own tutelary Deity. As for now after Navratri I have felt the need to invoke Durga in every meditation by visualising her beautiful form drawing her shakti into me. 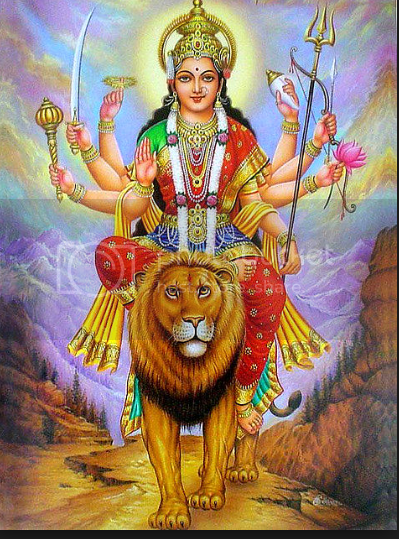 Seeing her as the protective shakti and also as the kundalini manifesting within the body/mind. Sally Kemptons book "Awakening Shakti" is very helpful. She is a former Swami on my path. "Om dum durgayei namaha" ! Parvati is also Lord Shiva's greatest student! Without anybody to teach the Vigyan Bhairav Tantra to, we all would be none the wiser as to the content, would we? I guess we all have different ideas about how the Divine Goddess appears to us and Durga riding the tiger is amazing and all, but it doesn't quite 'go there' enough for me, nor does Kali...where the Buddhist notion of Kwan Yin comes closer for me in regards, or even the Babylonian Ishtar. Seems a bit Kali like with the sculls stuff. Probably the Shakti attracts to what is most potent need at the time I guess. However I have decided to continuing the study of the Spanda Karikas. A 6 week teaching about the Shakti. Combining meditation and scriptural study. Here's a pdf of a book on Spanda karikas. I have also booked a flight ticket to go and see Ammachi, the huggin saint, who is touring in Europe this fall. I have contemplated for hours the great sweetness of Anandamayi Ma pictures in the past. All the images show His deep sweetness. I like especially the above picture, it seems to me the look that Virgin Maria should have. 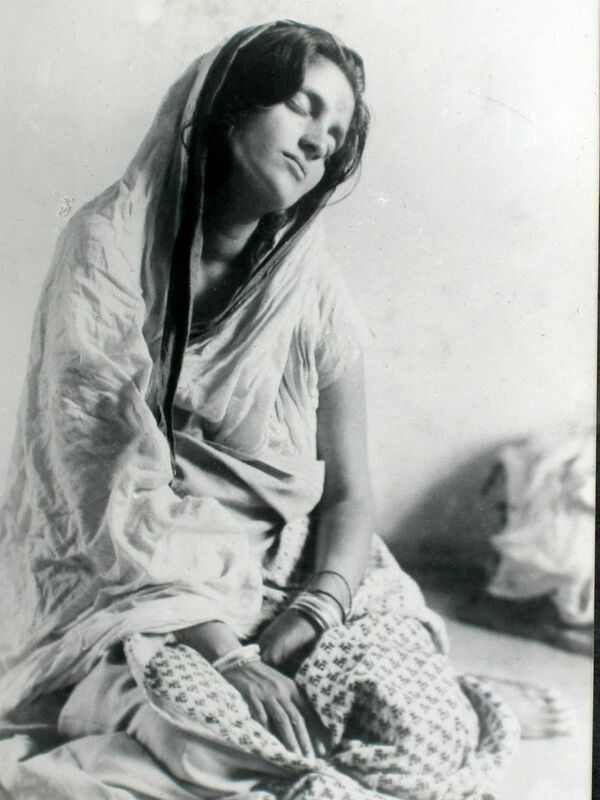 Anandamayi Ma is certainly on my top 5 people I would have died to meet while alive. Her life story and the actual Shakti in her words are phenomenal.